Editor’s note February 25, 2014: After extended use of the PS 210 BTNC, we have found that the product’s build quality doesn’t hold up over extended periods of testing. As such, we felt it was necessary to downgrade the product’s score. Individual experiences may vary.This product has since been replaced by the Phiaton BT 220 NC, which you can read about here. We’ve been eagerly anticipating Phiaton’s PS 210 BTNC headphones with baited breath ever since we first heard rumblings that such a product might be in development. We liked the PS 20 NC’s solid sound quality and effective active noise-canceling and we were even more impressed with the PS 20 BT’s use of Bluetooth 3.0 to improve wireless sound quality. Combining the two technologies seems like a natural progression, not just for Phiaton but for all the players in the headphone market. And yet, to the best of our knowledge, Phiaton is the first and, presently, the only company to offer such a combo in an earphone product. Sennheiser does offer three models that meld Bluetooth wireless with active noise-canceling; but they use the older Bluetooth 2.1 technology and cost at least $330. With the Phiaton PS 210 BTNC, you get the better sounding, battery-efficient Bluetooth 3.0, active noise-canceling, and a rechargeable Lithium-ion battery — all for $160. Sounds like a pretty good deal to us if the headphones function as advertised. Was Phiaton able to pull it off? 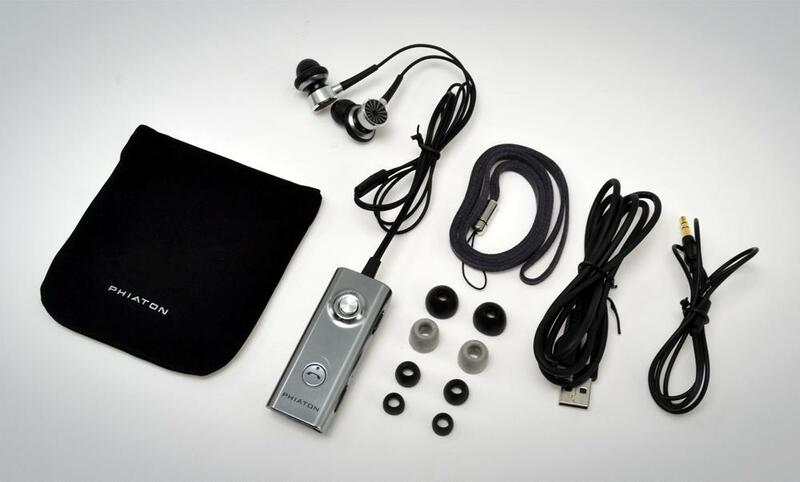 Phiaton’s classy dual-level box revealed the earphones nestled in foam cutouts within a clear plastic box. Along with the headphones we found a USB charging cable, 2.5mm to 3.5mm cable, four sets of silicone ear tips, one set of Comply foam tips, a carrying pouch, neck strap and owner’s guide. In photos the control module looks like it is made of metal. As it turns out, it is just shiny plastic. We were momentarily disappointed that the housing wasn’t a little more robust, but as we considered how these headphones would be used it was clear that metal would have been too heavy. Besides, the spring clip on the back is sturdy, as are the switches on the side and the buttons on the front. So the lightweight plastic doesn’t give the earphones’ control unit a cheap feel. Phiaton claims its “Noise-Blocker” technology can reduce ambient noise by up to 95 percent. The important question, however, is: What type of noise are the headphones attempting to cancel? Sustained, droning, or airy sounds — the sort you get while flying on a commercial jet, for instance — seem to be the kind of noise these earphones and headphones are shooting to eliminate. They tend to be less effective at more emergent noises like honking horns or, say, exploding fireworks. 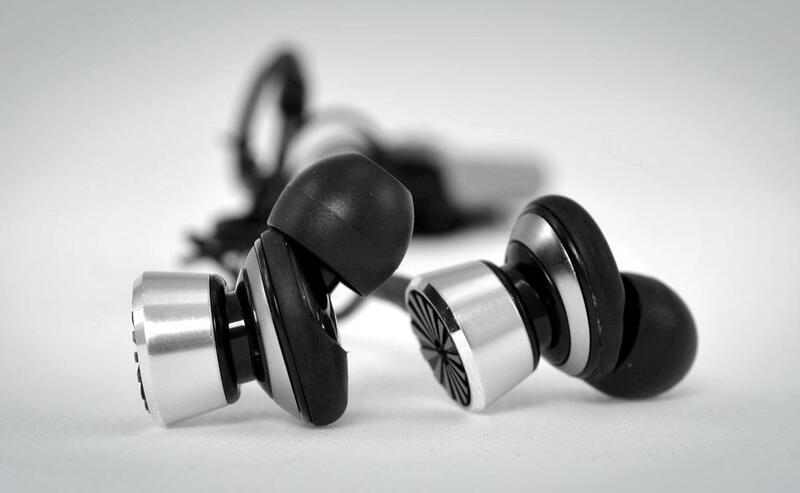 These earphones also include an “Echo-Off” function, which is intended to reduce background noise and echo during phone calls, and “Everplay-X”, which allows the earphones to be used even after the battery has died and Bluetooth is no longer available. Noise-canceling, however, is not available without battery power. Phiaton claims the PS 210 BTNC uses a 14.3mm drive unit with a 32 ohm impedance and a sensitivity of 110 db/mW. Operating time for the built-in rechargeable battery is estimated at 12 hours of calling, 14 hours of music playing, or 600 hours of standby, provided the noise-canceling function is turned off. With operating times like that, folks should be able to get through most U.S. domestic flights without having to recharge on the way. And iPhone users will know where they stand on battery life because these earphones send a power-level update that registers on the phone as a little battery icon. Why more Bluetooth devices don’t take advantage of this handy feature, we just don’t understand. The PS 210 BTNC uses Phiaton’s “half in-ear” design — a sort of hybrid between an earbud and canal phone. It helps to seal off the ear in two places, aiming to provide superior passive noise-isolation, better fit, and better overall sound quality. The in-ear portion of the headphone is angled toward the front of the ear, following the short-term direction of the ear canal. For those not familiar with this style of design, it can be a little confusing at first as to which earphone goes in which ear, but it’s worth getting used to. 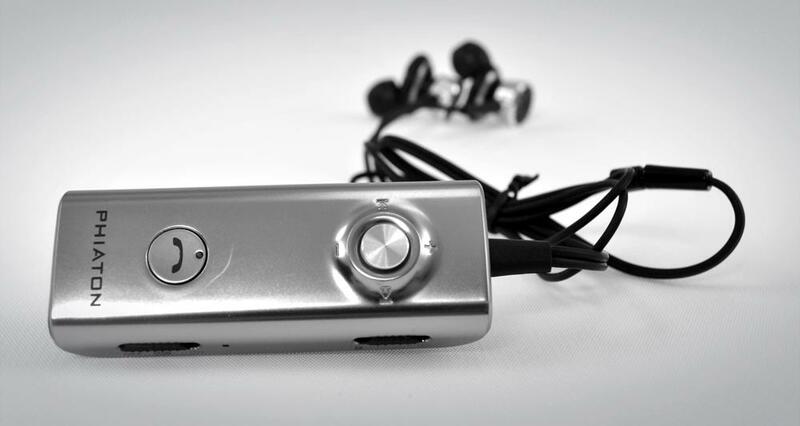 Finally, the control module provides the user-interface and control for the headphones, music, and phone calls. A five-position dial allows the user to pause, play, stop, advance track, reverse track, fast forward, rewind, and turn the volume up or down. Phone control is assigned to a separate button that can also access Siri on the iPhone. The same phone button is used to pair the earphones to Bluetooth devices. On the side of the control module are slider switches for the noise-canceling feature, and a power switch with a locking option to prevent unintentional adjustments and accidental hang-ups. Located at the bottom of the module is a flip-out tab that hides the mini-USB port and the 2.5 mm headphone input jack. Our single design complaint is purely aesthetic: we don’t care for the radiating “sunburst” pattern on the earphone’s end-cap. It has a sort of 70s retro look that isn’t in keeping with the rest of the product’s design. Normally headphones don’t require much setup, but when it comes to Bluetooth devices, things get more complicated. This is often a frustrating process, but in this case it really isn’t that bad. First, the built-in battery must be charged. Our already partially charged battery took less than an hour to charge to full capacity. From there, getting the PS 210 BTNC paired to our Bluetooth devices was consistently snappy. Even our buggy laptop managed to pair up with no major kerfuffles. We appreciated the voice prompts from the earphones’ firmware notifying us that the unit was in pairing mode, then, later, indicating the devices were successfully connected. As it happens, voice prompts also indicate when power is being turned on or off. The PS 210 BTNC won us over after just 20 seconds of play time with its warm, detailed, and dynamic sound. This is, by far, the best-sounding wireless headphone we’ve ever evaluated and certainly one of the best earphones — wireless or not — that we’ve ever put in our ears. High frequency response is rolled off a bit, but not so much that any detail is lost. These earphones lend just the right amount of sparkle to cymbals, an organic woodiness to reed instruments, and a tasty bit of zip to brass instruments — all loaded with subtle overtones. Vocal sibilants — which can have a way of piercing the ear with overly bright earphones — were smooth and silky, with plenty of definition. If you like your highs on the warmer side, the PS 210 BTNC will surely please. Midrange performance was wide open, revealing all of the nuances involved with every instrument and voice. We did notice that the lower end of the midrange section was a little rich, but the slight curve upward served to give aggressive music a meaty, muscular sound while lending more delicate tracks a comforting, velvety tone. We especially liked the way distorted guitar was treated. The PS 210 BTNC was able to communicate the intricate crunchiness of edgy guitar effects without distortion, reproducing even the dirtiest tones with a cleanliness usually experienced only with high-end, full-sized headphones. Bass response suited our tastes very well. Not only do these earphones produce ample punch and respectable extension down to the lowest notes, they are tonally accurate in a way that (again) reminded us of very expensive over-ear headphones. Bass response did take a little bit of a hit in noisy environments, but a quick boost of the volume took care of that in most cases. The PS 210 BTNC brings more than just excellent voicing to the table — it is also remarkably dynamic. Listening to these earphones will expose you to what you’ve been missing with lesser quality designs. Response to volume changes, both subtle and wide, was lightning fast. This attribute, paired with outstanding definition between instruments, served up sound that was as close to studio-quality as we’ve ever gotten from an in-ear headphone. While it is nice to know that these earphones aren’t entirely reliant on battery power, we don’t think anyone will ever feel the need to plug in the provided headphone cable and tether themselves to their device. We did experiment with the hardwire option but — if you can believe it — the Bluetooth connection, with its superior amplification, actually provided better sound. One of the things we liked best about these earphones’ noise-canceling circuit is that it doesn’t change the sound quality dramatically. Many noise-cancellers sound notably better with noise-canceling turned on than they do with it off, compelling us to turn it on all the time — even when unnecessary — to get the best possible sound. With the PS 210 BTNC, you get the same fantastic sound quality whether noise-canceling is turned on or not. The PS 210 definitely ranks in the top 10 percent of the noise-cancellers we’ve tested over the last few years. It excels at cutting out the wash of sound generated by a light-rail train and significantly dulled the ramblings of our gas-powered lawn mower. We imagine it would do very well while on a commercial flight as well. To be sure, we never had any problem drowning out the world around us while listening to music. We never tired of wearing the PS 210 BTNC. Our ears never needed a break, likely because the earphones never put any abnormal pressure on any one part of our ear’s anatomy. While the level of comfort will vary from user to user, we’re hard pressed to think of a more naturally comfortable earphone design. While many headphone companies talk big about creating revolutionary products, Phiaton has actually done it. The PS 210 BTNC is the best-sounding wireless earphone we’ve ever heard and, for that matter, one of the best earphones we’ve enjoyed in general. We think that even the most persnickety audiophiles will respect its dynamic, detailed performance. As far as we’re concerned, its versatility and user-friendliness is unmatched. In fact, aside from one minor aesthetic gripe, the PS 210 BTNC is nearly perfect. As such, it earns a score reserved only for the very best products and, of course, our Editor’s Choice award. Well done, Phiaton.